The B5 Systems SOPMOD Bravo stock is a lighter more compact version of the Enhanced SOPMOD stock, but at even a more attractive price. The B5 Systems SOPMOD Bravo stock maintains the SOPMOD's great cheek weld, one piece ambidextrous anti-rotational QD swivel mount, no slip cushioned buttpad, and improved suregrip stock latch. 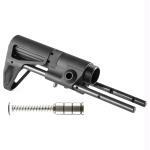 The Bravo does not have the storage capability the Enhanced SOPMOD has, and instead angles the rear of the buttstock ensuring consistent stock placement against the shoulder and cheek. 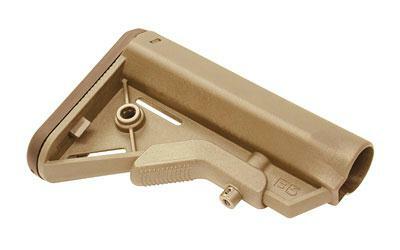 Made of reinforced polymer, the stock fits Mil-Spec M4-type receiver extensions.